Berry, M., Brandon, M., Chaskin, R., Fernandez, E., Grietens, N., Lightburn, A., McNamara, P.M., Munford, R., Palacio-Quintin, E., Sanders, J., Warren-Adamson, C., & Zeira, A. This paper introduces a special collection of this edition of the International Journal based on a series of international pilot studies designed to explore the messages and methodological challenges derived from attempts to understand proximal or sensitive outcomes as steps on the way to more distal or long term outcomes in community and family based centres. This paper gives background and summarises a collection which has a theoretical introduction followed by seven case studies compiled by scholars from seven different countries representing the International Association for Outcomes Based Evaluation and Research in Child and Family Services. Lightburn, A., & Warren-Adamson, C.
This paper explores the domain of family centres from the perspective of outcomes. Family centres are a cross-national phenomenon of complex, integrated services for children and their families, located in one site. The paper argues that centres are evaluated from an over-simplified and under-negotiated perspective of distal outcomes - the longer term outcomes owned by the agency and its professional stance. Instead, the authors propose a theory of change enabling more effective planning and evaluation of practice. The implication of the theory of change leads us to construct a triangular outcome framework embracing: a) distal outcomes, and also, b) proximal outcomes - steps-on-the-way, part of the journey of care and change; and, mediating outcomes - outcomes put in place to establish a milieu, disposing the centre to effective care and change. There is a concluding discussion about the methodological promise of collaborative enquiry in identifying and categorising different outcomes. This paper reports an exploratory study which attempts to identify processes and interactions leading to family change. By interweaving narratives of two workers and two parents from Barnardos' Children's Family Centres the paper highlights `sensitive outcomes' and steps-onthe-way to change. Pervasive life stresses inherent in the deprivations of poverty including inadequate housing and financial resources, sole parenthood, absence of social supports and the experience of domestic violence reduces parents' coping skills. The supportive and accessible environment of the Family Centres worked effectively to contain the families in crisis. Key messages from this study are the need for services to recognise the multiple and overlapping nature of stressors and disadvantage experienced by parents so that support can afford containment and tackle stressors at the child, family and community levels simultaneously. That service users can provide insightful input on their needs, their experience of service interactions and service effectiveness, and contribute usefully to service planning is acknowledged. This paper reports on the Melbourne, Australia component of the International Study of Sensitive Outcomes. One family was recruited from Berry Street Victoria in Melbourne to participate in a case study. A naturalistic case study of the work with this family has been conducted from shortly after intake to termination. The intervention under examination was that of family therapy. The study utilised the principles of participant action research to identify the 'steps-on-theway' to the identified 'crude outcome' of strengthened family relationships. Important 'stepson-the-way' included clarification of limits and boundaries to ensure safety in the home, family members becoming more accountable for their movements through more active communication, rituals of nurture being initiated to engage an estranged young adult family member and family strengths and resources being affirmed in therapy sessions. The role of the Family Centre as 'container', along with the evident synergy between the Centre and its ecological niche, emerge as instrumental contextual factors in the change process. The last decade has seen a growing interest in community-based family support centres as a valuable alternative to traditional psychosocial interventions. Positive effects in several areas are thought to occur even if we do not know precisely how. In these circumstances, it is very difficult to know if we are speaking of the same thing and the same intervention models and goals when we are speaking about community-based centres supporting families. Furthermore, outcome evaluation with international validity becomes very difficult if not impossible. Therefore, in order to build basic knowledge about these centres, to build up the means to create valid outcome evaluations, to examine sensitive outcomes, and finally to set the basis for international comparison, we have undertaken a case study of a "Family House" from Quebec. We present here our analyses relative to the Centre's context, nature, structure, special characteristics and processes. 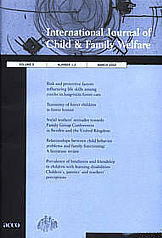 A case study approach was used to examine an English Family Centre as part of an international research collaboration which aimed to explore aspects of sensitive outcomes or "steps-on-the way" to accepted longer term outcomes, such as changed behaviour in the child, or more confident parenting. Key learning came from understanding how the Family Centre staff created a culture of care which appeared to promote enhanced confidence and competence, both in families and in workers. The centre also appeared to be able to extend and export its culture to help look after external teams and individuals and to prop up ailing parts of its own local social services agency. These findings have implications for the children's workforce and the way in which child and family services are planned and delivered within large organisations in a climate which is beginning to challenge defensive, bureaucratic and procedurally led practice. This paper reports on a small exploratory case study of family centre practice examining in particular the nature of proximal or process outcomes claimed by a mother and two practitioners following two productive years during which a mother and family have been in contact with the centre. This study looks to understand proximal processes from an outcome perspective through case study and particularly by examining the narrative accounts of practitioners and mother. The national and local contexts are explained along with the centre's programmes and aims. The author acknowledges the components of a theory of change as a basis for the search for outcomes as "sensitive outcomes" or "steps-on-the-way". Thereafter the paper reflects on the methodological challenges involved and considers issues a research team or collective might take into account in exploring the domain of sensitive or process outcomes in centre-based practice. What do we need for a successful intervention? The case of one Israeli family in deep distress Zeira, A. This paper describes the steps-on-the-way to a successful intervention with one Israeli family in deep distress. The case study outlines the work of a support centre in a welfare agency in relation to the growing poverty cycle in Israel and the local and national welfare context. Partnership between researchers and social workers, the researchers' analysis of case records and their interviews with the social workers elucidated the process of help. This allowed the researchers to provide different perspectives for possible help to the family. Our findings indicated that wrapping the family with concrete services does not necessarily ensure the collaboration that may lead to a successful intervention. In this case study, the critical ingredients enabling progress in the process of treatment were respecting the client and containing her difficulty. Munford, R., Sanders, L, & Maden, B. This paper explores the micro-processes involved in family change. It is part of a wider series of studies undertaken across several nations that sought to develop our understanding about the ways in which community centres contribute to individual, family and community change. The paper reports upon a case study of one family which attended Te Aroha Noa Community Services in New Zealand and uses a detailed examination of a particular incident to shed light upon the theory of change which underpinned the work of the Centre. The paper also draws upon life history material from the parents who sought assistance from Te Aroha Noa and material collected in focus group interviews with staff, volunteers, board members and other service users at the Centre. The paper concludes that because they typically provide a wide range of different types of services and are able to respond to diverse needs, community centres are ideally placed to create and sustain change momentum within families.